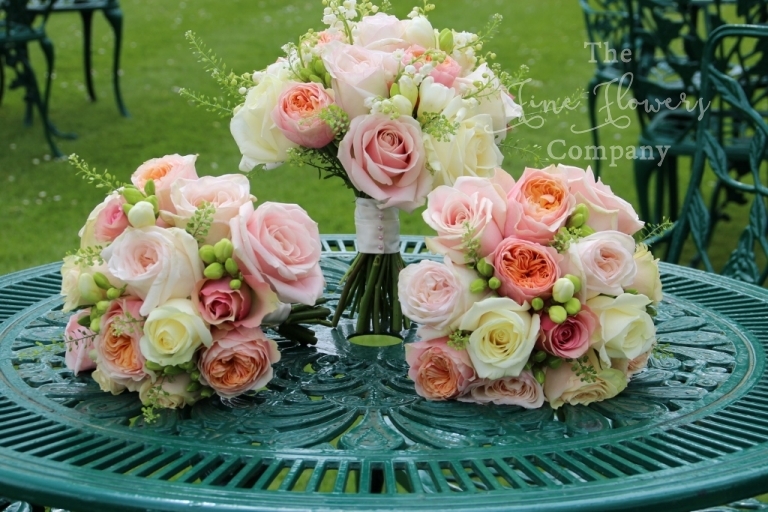 For these wedding flowers at Monkey Island we created a really mellow mix of ivory & cream, palest blush pink, beautiful soft apricot and warm pinks, for an effect which looked really pretty especially the beautiful outdoor setting. Carina and Stuart were lucky enough to be able to hold their ceremony outside, and the weather was amazing just at the crucial time. 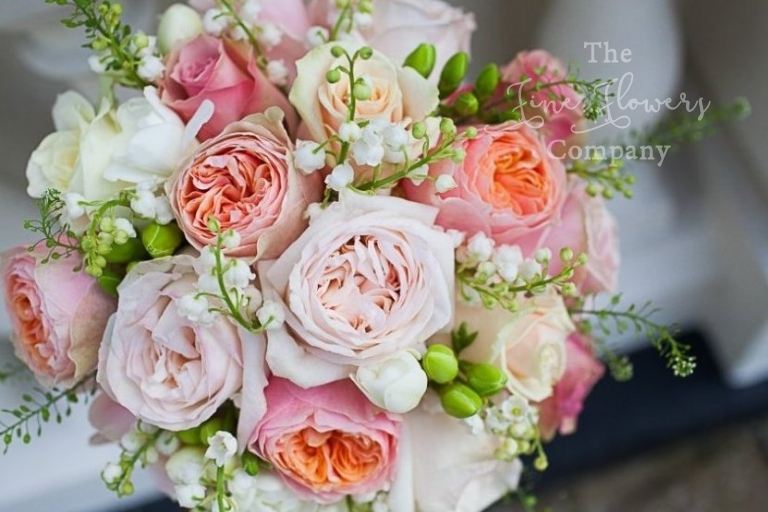 For Carina’s bouquet we created a gorgeous bridal bouquet of roses, including specialty garden roses – blush O’Hara roses and pale apricot / coral Vuvuzuela roses, with pretty wisps of scented lily of the valley. 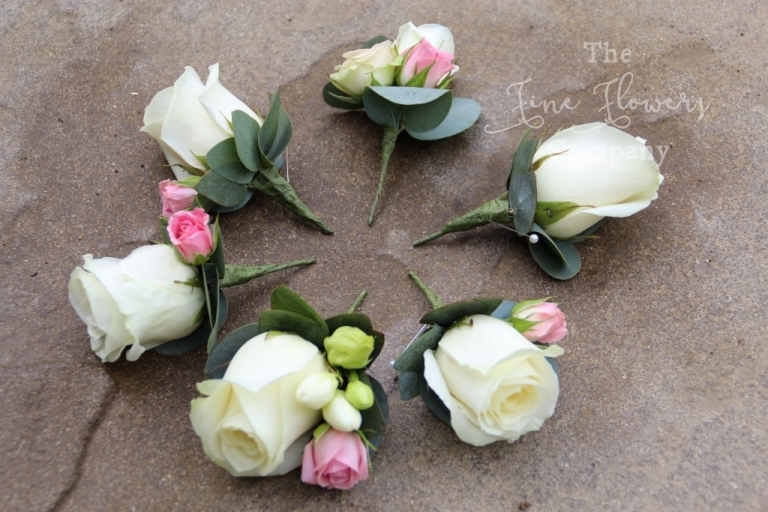 The bridesmaids, dressed in a very soft and pale dusky pink, carried coordinated bouquets, like Carina’s bar the lily of the valley which we reserved for the bride only. The incredibly cute young flower girls also held much smaller versions of the adult bridesmaids bouquets. After much to-ing and fro-ing trying to second guess what the weather was going to do, the ceremony was laid outside the garden pavilion, starting the aisle with two pretty hired bay trees dressed with flowers, and ending with two statement pedestal displays bursting with blooms. We used a mix of tall delphiniums, roses, apricot stocks, scented lilies and blush dahlias, and the effect was superb. A long & low tank vase with matching flowers was used to dress the ceremony table, and then moved over to the top table for the meal. For the Monkey Island wedding reception, Carina and Stuart opted for a mix of half and half, using some tall vase displays, to add drama as you walk into the room, and some low fish bowl vase centrepieces, to give a cosier and more interesting mix. The large oval top table was dressed with the long & low centrepiece, flanked by small posies of flowers. As oval top tables end up having such a big expanse of white table linen on show, we also added additional small vases for the bridesmaids to place their bouquets in them, once the photos were taken, giving welcome additional flowers on the large top table. The beautiful photography is thanks to Mark Cachia at Mark Cachia Phtography, whose work I really admire. 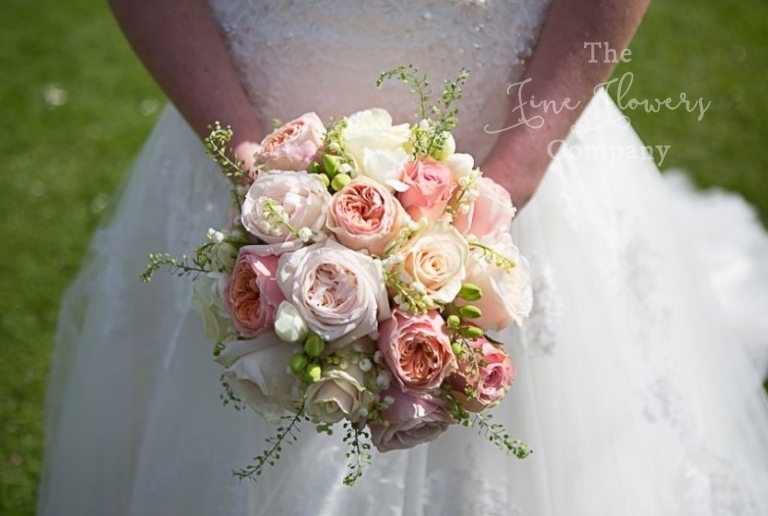 He has captured these wedding flowers at Monkey Island and the whole wedding, in a really natural, informal and relaxed style really perfectly suited to well Carina and Stuart’s whole wedding and the relaxed river side setting. Carina and Stuart were kind enough to share their photograph albums with me and Mark’s shots of the wedding, guests and the finer details (my favourite being the peacock in a tree and the slightly sulky cute flower girl), are priceless. So please check out his website by clicking here. If you are planning your wedding flowers at Monkey Island and need more inspiration, please visit our other featured wedding flowers at Monkey Island posts, which will give you more ideas of what works well here, or search our gallery pages and other venue weddings for wedding ideas in your colour scheme. We have a vast array of wedding flowers shared on the website so you will be entranced and immersed for hours in pretty wedding ideas.